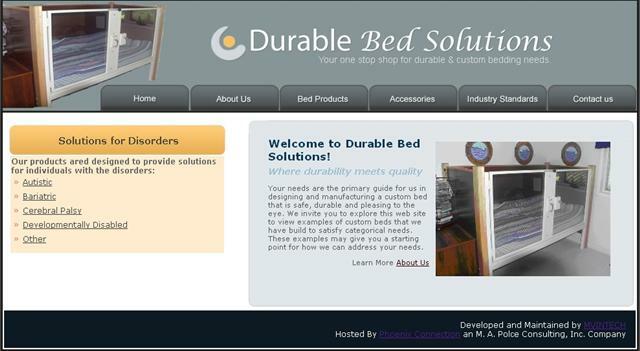 Durable Bed Solutions, Inc. was created in May of 2006 as an engineering, design and manufacturer of custom beds and accessories for persons with special needs. The origin of Durable Bed Solutions, Inc. can be traced back to 1999, when the Central New York Developmental Disabilities Services Office first ask Lakeside Consulting, Inc., a precursor of Durable Bed Solutions, Inc., for engineering and design help in solving recurring problems with bedrail entrapments. The result of this collaboration lead to the creation of the now patented See-Thru Shields. These entrapment prevention devices were presented across New York State in a demonstration of best practices hosted by the Office of Mental Retardation and Developmental Disabilities in the fall of 2000. Based on user feedback and our own desire to constantly improve our products, the See-Thru Shields have gone through several technical upgrades and are sold across the country.